• Official importer for Bulgaria for various agricultural machinery and technologies, produced by leading European companies – sale, service, spare parts, leasing, dealer network. • Maintenance and Service of automobiles. • Spare parts and accessories for automobiles. • Importer of the PETRONAS Lubricants products - Tutela, Ambra. Vanto Trade Auto was established in 1990. It is one of the first private companies in the automobile business in Bulgaria, the Chairman of the BD – Mr. Todor Nikolov being one of the founders of the Union of Importers of Automobiles in Bulgaria and its first President. At the very beginning of the market economy in Bulgaria Vanto Trade Auto established itself in our market as a reliable partner for its clients. The company built the first largest, not only for Bulgaria but also for the region, modern commercial and service center. Vanto Trade Auto is the first private company, which in 1992 started the import of heavy vehicles to Bulgaria in its capacity of authorized dealer of the Italian giant IVECO. Since 1997 till March 2013, Vanto Trade Auto is the official importer of agricultural machinery New Holland: tractors, combine harvesters, telehandlers, forage harvesters, balers. Today Vanto Trade continues to work and import the production of the leading European producers - Gregoire Besson, Fantini, Breviglieri, OMA, Nardi, Zuidberg, ILPER, Berthoud and many others for more complex servicing offered to their customers. 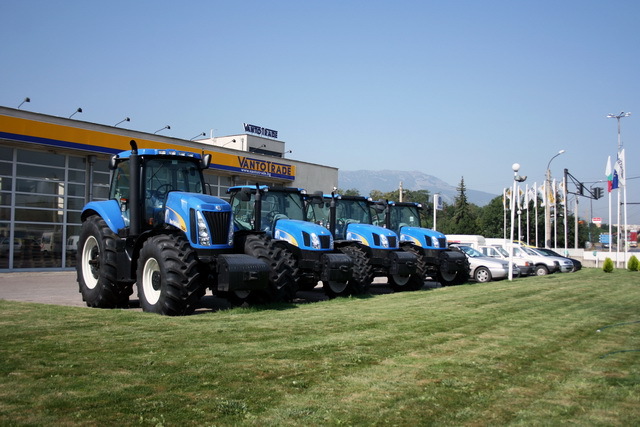 The dealer network in Pleven, Dobrich, Ruse, Stara Zagora, Plovdiv, Sliven, Sofia and Yambol, established and well working during the years, facilitates the clients in purchasing and maintenance of the necessary agricultural machinery. Advantageous leasing conditions also contribute to the more flexible servicing of the clients. For the equipment they are importing, Vanto Trade Auto provides after sales guarantee and maintenance and in time delivery of original spare parts. As our website is made to facilitate our Bulgarian customers, and farmers who are resident on the territory of Bulgaria, in the English version the site is only informative and not full with the detailed model information that is present in its Bulgarian language section. Thank you for visiting our Internet site. We are confident that you will find interesting and useful information. If necessary you could always contact us by phone, by sending us an e-mail or by visiting our offices.